QUESTION: How long have you been scrapbooking or paper crafting? I am thinking it looks pretty simple so....Jump, hop, skip or pop on over to the Scrapbooker's Parade Blog to see all what the 'Celebration" is all about. Oh and have a wonderful Saturday... Craft something. Happy Friday everyone, it is time for a new Playing in Paradise. This week Angela is challenging us with a watercolour theme. I created two clean and simple cards. With both cards I created a frame with cardstock; I used watercolour crayons and a aqua painter to get the watercolour effect. Once the water colour was dry I stamped the image and sentiment. With the first card I finished with a single piece of twine. 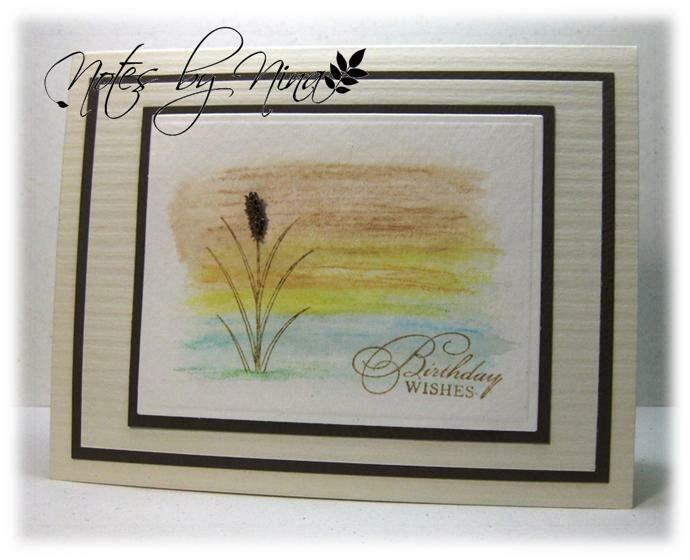 With this second card, I created a bullrush using Flowersoft, glitter and Flowersoft wire. I secured the wire by poking a hole through the paper and feeding the wire through, I taped it to the back before gluing the panel to the frame. Stop by the Playing in Paradise blog to take a look a the wonderful creations the design team made to inspire. 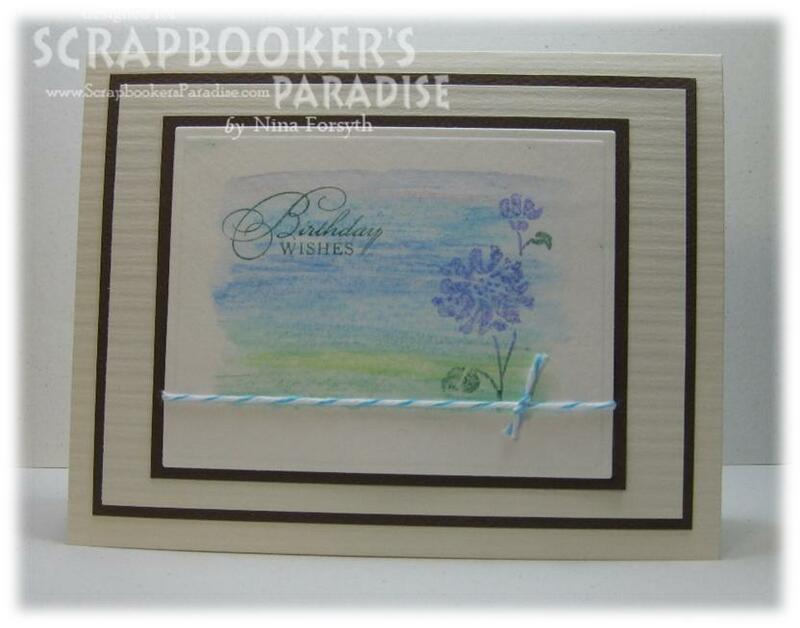 Supplies: Natural Ivory and brown cardstock, Stampin’ Up!- watercolor trio, misc twine, Flowersoft, Glitter Ritz. No card post today, I am too excited about my new binders. I keep all my stamps from The Stamps of Life in binders. They are the only clear stamps that I have actually taken the time to organize mostly because Stephanie sends out storage sheets with the stamps. 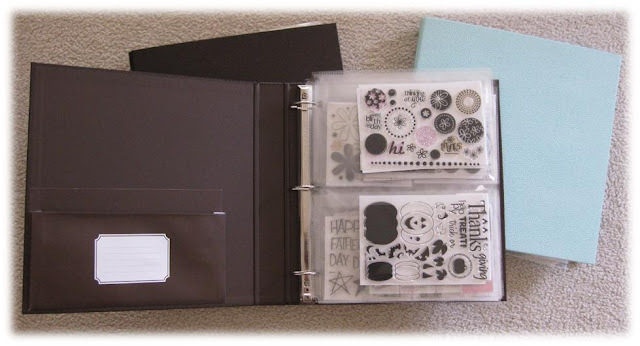 I however put them in these ugly black binders that do absolutely nothing for the inspiration flow in my craft space. I also get a little frustrated with the storage sheets because if I lay my binders flat the stamps slide out the top of the storage sheets. I fixed that by putting a piece of Velcro to hold the stamps in but with clear sheets it does not add to the 'pretty' factor. I have been the hunt for storage sheets that have a small fold at the top to hold the contents in place, I will admit that my actual 'hunt' was taking a peak whenever I was in one of my local office supplies store but you get the idea. Anyhoo, I found exactly what I was looking for in the Martha Stewart office supplies section at Staples today.. office supplies.. who knew, but hey it is Martha so I should not be surprised. I picked up 3 packages of the Secure-Top Sheet Protectors with 2 pockets, I was also drawn to the Martha S binders. Although they had beautiful decorative binders I went with solid colours. The storage sheets are not as thick as the ones I get from The Stamps of Life , but they do store two sets of stamps back to back the same and the fantastic little secure flat stops the stamps from sliding out. My stamps are just as organized and the binders are pretty to look at. I just had to share :). 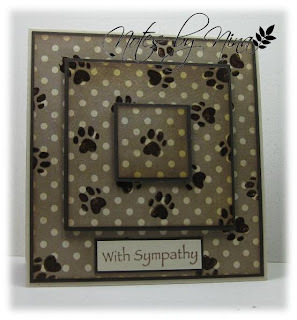 My husband asked me to make a card for a co-worker who recently lost a pet. 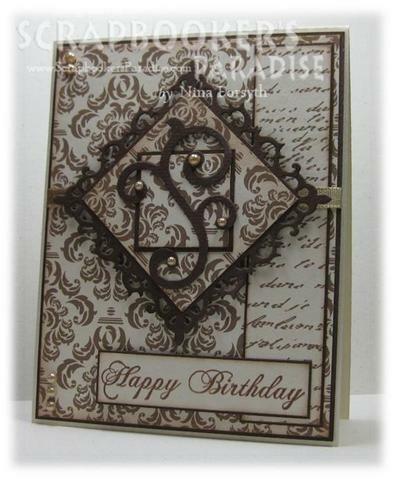 I heat embossed with brown to create my own pattern on simple DP. Each layer is popped up using foam tape. RIP Jinks. Supplies: Natural Ivory and brown cardstock, Designer Paper-Simple Stories, Inkadinkado - Pet Paw, Hot off the Press-Tiny Words. Hello Monday :). 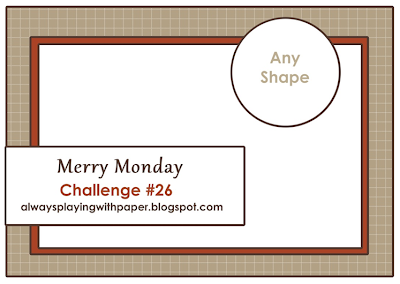 We have a new Merry Monday challenge to tackle this morning. Lesley has designed yet another fantastic sketch for us this week. 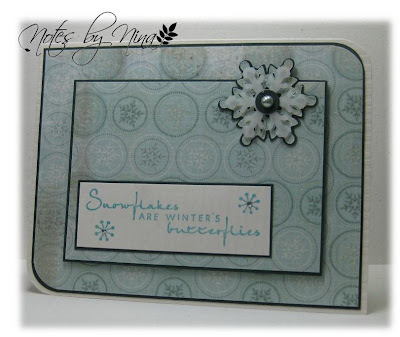 I used my Cricut - Winter Lace cartridge to do the layered snowflake then added a vellem top layer and finished with a pearl. 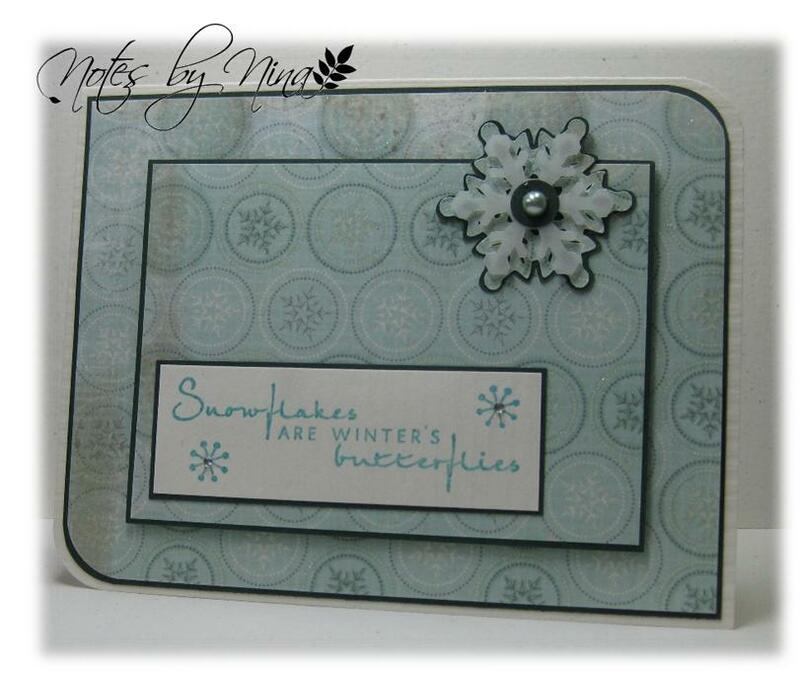 I stamped the sentiment and embossed it with clear embossing powder then stamped two snowflakes and added tiny gems. Supplies: Cream and green cardstock, Designer Paper-My Min's Eye, Cricut-Winter Lace, Verve-Christmas in the Air, Recollection pearls and gems. 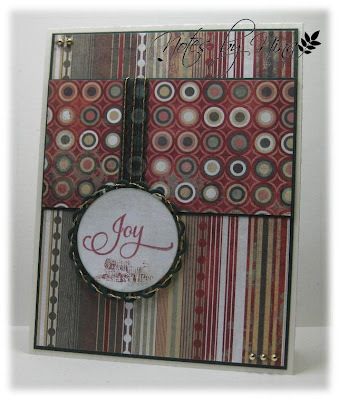 Stop by Lesley's blog to see all the Design team samples and to join in the fun. Happy Friday everyone, it is time for a new Playing in Paradise challenge. 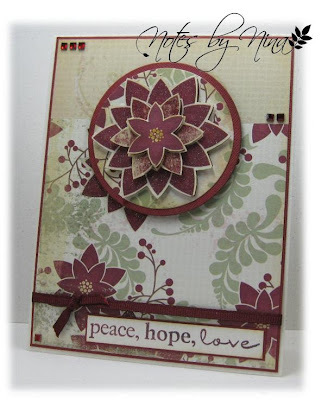 This week Allison is inspiring us to create using the sketch she has designed. 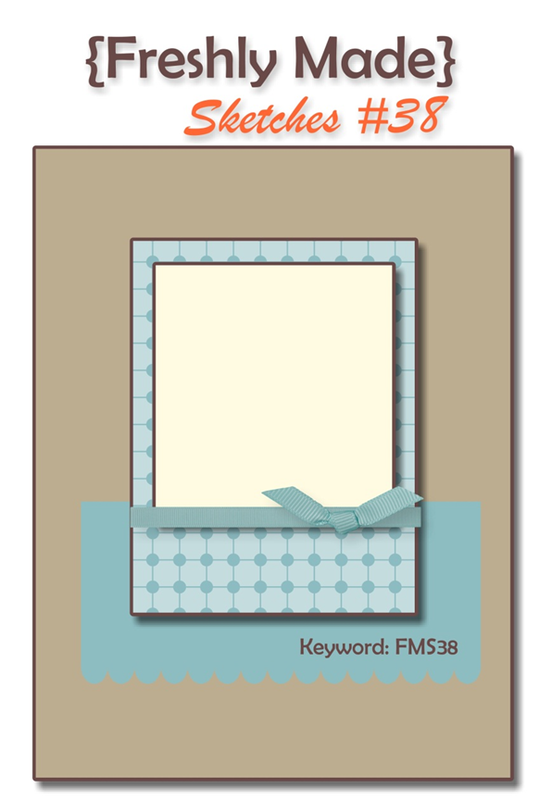 Isn't this Designer Paper beautiful, it is from a recent purchase from Scrapbooker's Paradise. I could not wait to create something with it. I think I made this card way more compicated than I needed too. I used lots of layers, and used foam tape on the center element to pop it up. I finished with some pretty pearls. 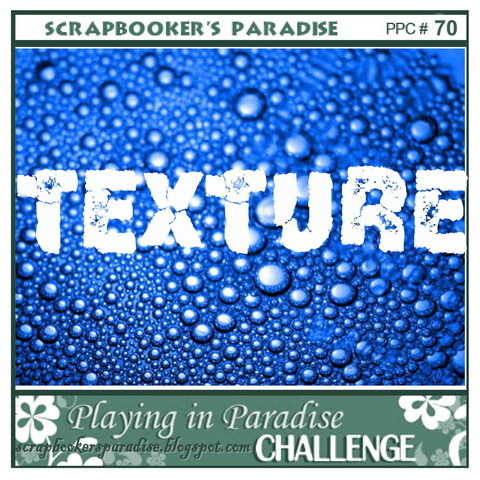 Stop by the Playing in Paradise blog for the fabulous samples created by the design team. 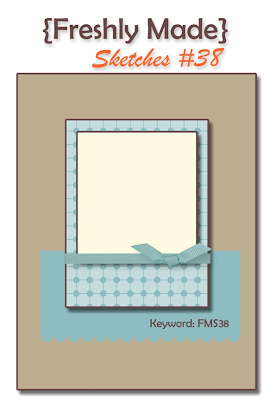 Supplies: Natural Ivory and brown cardstock, Designer Paper- Canvas Crop, Fiskars- Cardmaking Happy Birthday, Spellbinders die cuts, misc punches, Sizzex die cuts, misc ribbon, Recollection pearls. Happy Monday, it is time for a brand new Merry Monday Challenge. This is the sketch Lesley has created for us. 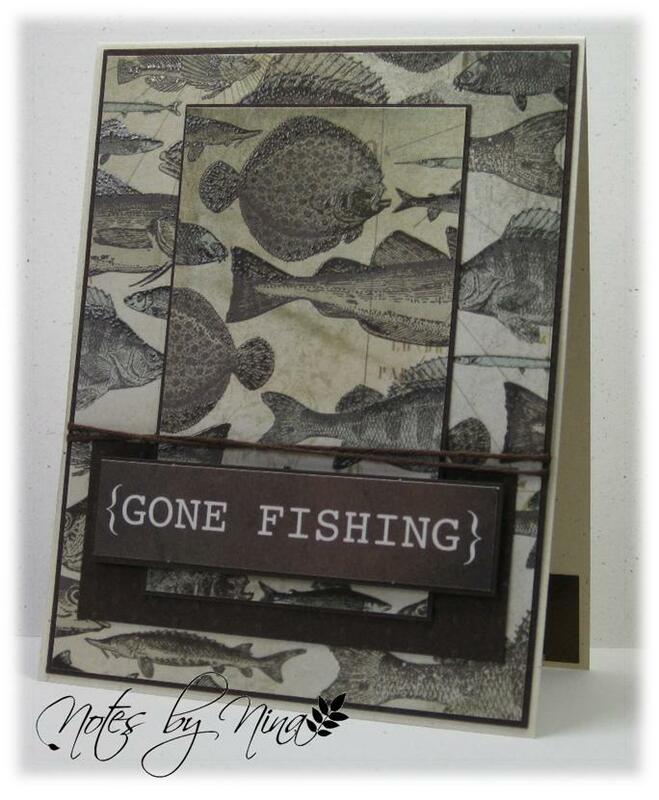 I was a little on the lazy side when I created this card, I let the designer paper do all the work. I cut three layers of the DP poinsettia by hand and used foam tape between the layers to add dimention. I used a complimentary paper for the top half of the card. I finished with some square gems and some ribbon. Stop by Always Playing with Paper blog to see what wonderful creation the Lesley and the design team have created. We would love to see you play along. 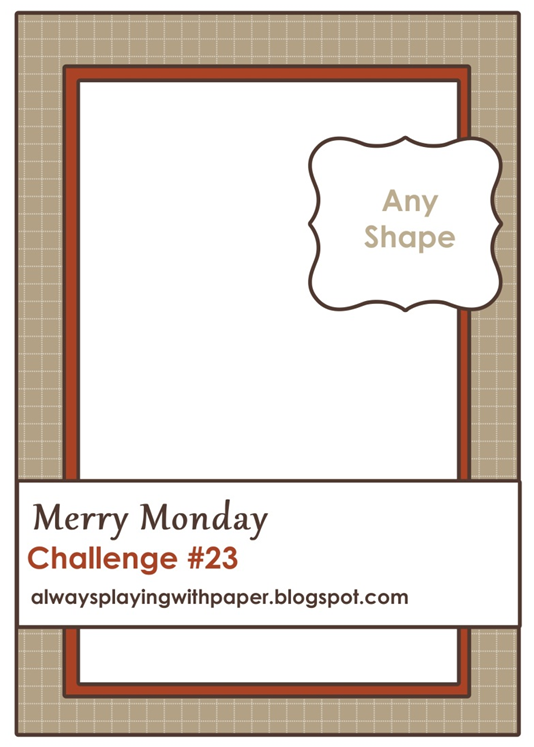 Supplies: Cream and burgundy cardstock, Designer Paper-My Mind's Eye, Fiskars-Peace, Spellbinders die cuts, Recollections gems, misc ribbon. get a card done. The card is last minute too, for Father’s Day for my husband. This sketch was perfect for what I had in mind for the card. I heat embossed the focal image with black ink and clear embossing power, two layers give it a nice 2D look. I could not resist added some twine, a silver button and a couple of silver stickers dots. 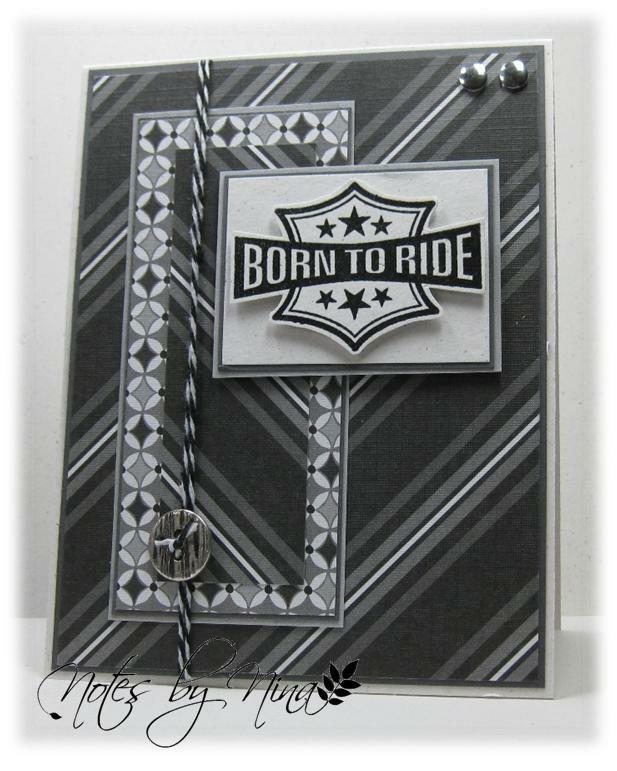 Supplies: Natural white cardstock, Designer Paper- Momenta, Close to my Heart – Born to Ride, misc button, twine and embellishments. 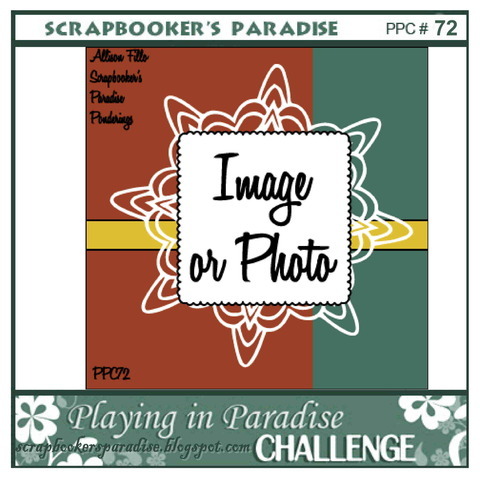 Happy Friday everyone, it is time for a new Playing in Paradise challenge. This week Jessi is inspiring us to create something inspired by "Under the Sea". Isn't this stamp set adorable, I have had them for a long long time and have not inked them up. The designer paper is a new purchase from Scrapbooker's Paradise. I stamped the crab and sentiments in blue then heat embossed with clear embossing powder, the crab is coloured with my Tombow makers. 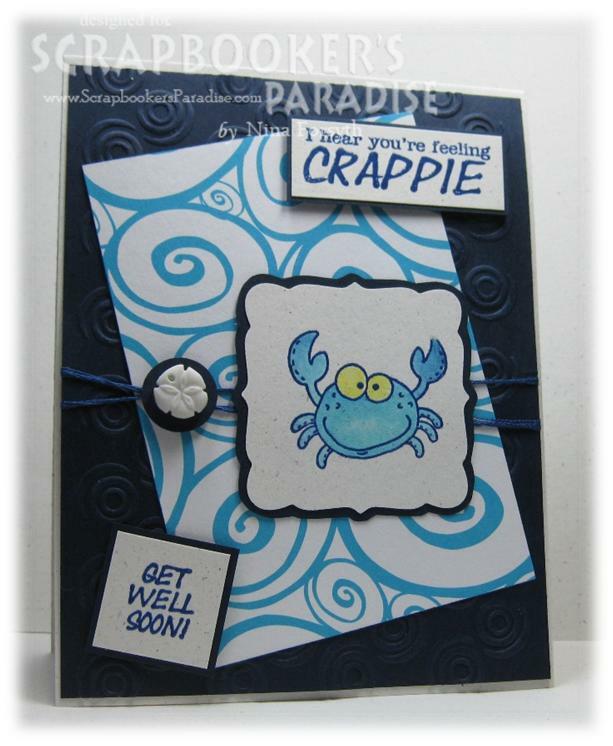 I added a little background texture and finished with tread and a little sand dollar embellishment. Supplies: Natural Ivory and navy cardstock, Designer Paper- Canvas Crop, Whipper Snapper Designs-Feelin' Fishy, Cuttlebug embossing folder, misc embroidery thread, circle punch and misc sand dollar button. I love that I am making Christmas cards in June :), my sister always asks how I get in the spirit but you know I don't think my brain is in Christmas mode but just in the mood to create cards. With that said it is time for a new Merry Monday challenge and Lesley had another fantastic sketch for us. I was going for some funky looking paper this week and found it in my Basic Grey stash, I used some spellbinder dies then threaded gold twine through the edges. Supplies: Natural Ivory and green cardstock, Designer Paper-Basic Grey, Verve-Joy, Spellbinders misc green ribbon and gold twine, gold pearls Recollections. 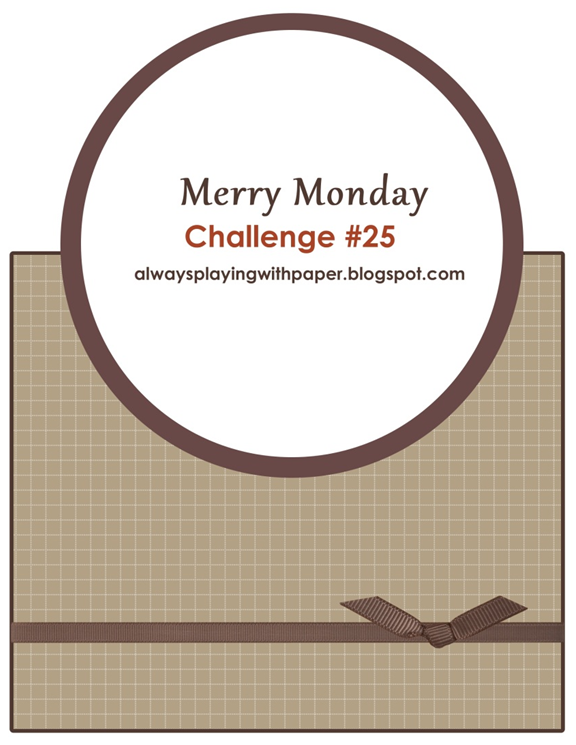 Stop by Lesley's blog to see what the design team members have created for inspiration and join us for this weeks challenge. Father’s Day is just around the corner and I am cutting it close to get this card popped in the mail. I have to admit I have been too busy enjoying the sun in Las Vegas this past week to even think about wanting to be in my craft room, I sure enjoyed playing with a little paper and glue today though now that I am back home. to come up with some fishy theme each year for Father’s day and I though letting this DP could do all the talking. Supplies: Natural Ivory and brown cardstock, Designer Paper-Kaiser Craft, misc twine. Happy Friday one and all, time for a new challenge for Playing in Paradise and I am suppose to be the hostess this week however right about now I am in a plane somewhere over the USA or Canada. A huge thank you to Pam for doing all the posting work in my absence. 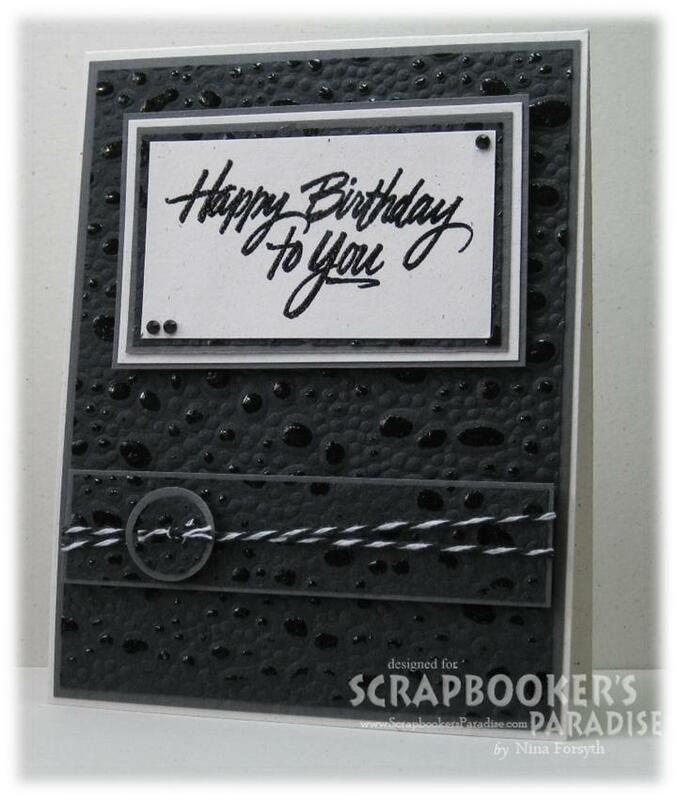 The challenge was my idea though as I love texture on a card. My sister found this fabulous designer paper and let me have a sample. 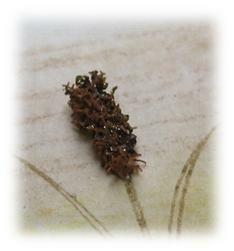 It almost feels like mulberry with glossy rubber bits on it. In my eyes it was perfect for a masculine card. 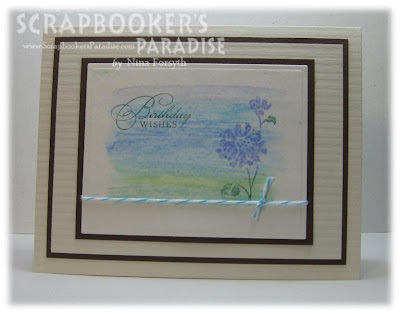 Supplies: Natural Ivory and grey cardstock, Designer paper- Unknown, Stamp it - Happy Birthday , misc twine and circle punches, Recollection gems. Please visit the Playing in Paradise blog to see the projects from the other Design Team members. Play along with us and you could win the prize. We love to see your projects. Just a quick post this morning. The Zellars stores here in Victoria are shutting down and Target’s will open next year, so there are some good sales on right now as they clear stock. Although there is really not much in the craft department I did find a pretty designer paper pad. I used lots of layers, heat embossed the wedding image then finished with a little black twine with sparkles in it. I tried to take a picture that would show the pretty metallic background, unfortunately it did not pick up the pretty twine. 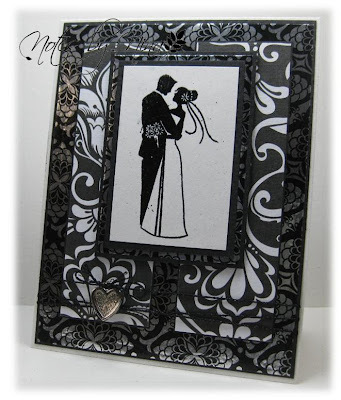 Supplies: Natural white and black cardstock, Designer Paper-Momenta, Inkadinkado – Wedding, misc twine and charm. 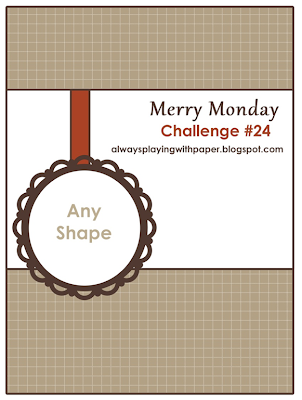 Happy Monday, it is time for new Merry Monday Challenge. I hope that you come and join us this week, we love to see what you create. I was determined to use this lace, and I am glad that it worked well with this paper but I am not sure I placed the sentiment in the best place. You know when you look at your card and just sort of poke at it and wonder what piece to you can change. Oh well :) I added some sparkle to the snowflake with some Stickles and added pearls and I was happy. 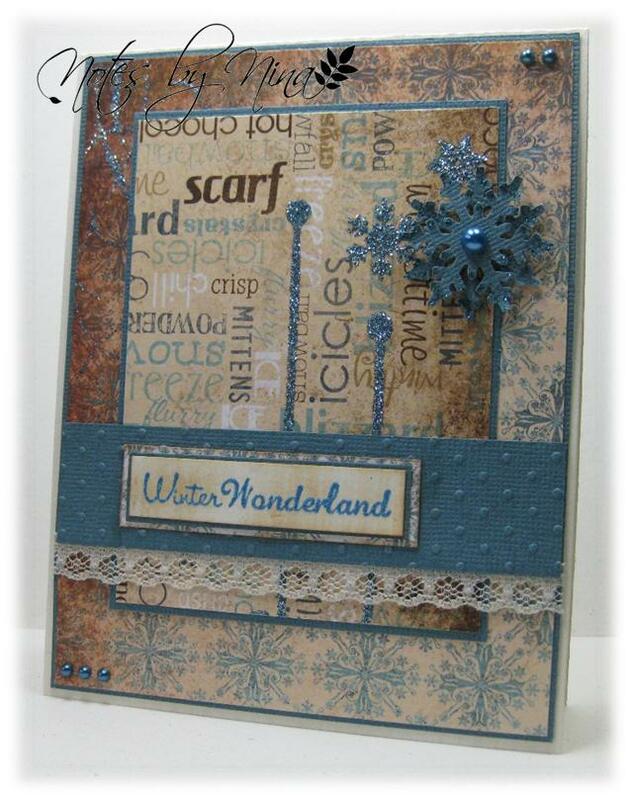 Supplies: Natural Ivory and turquoise cardstock, Designer Paper-My Mind's Eye, Fiskars - Winter Wonderland, Martha Steward punches, misc lace and pearls, embossing folders, Stickles. Take a peek at Always Playing with Paper to see the fabulous creations from Lesley and the other design team members. 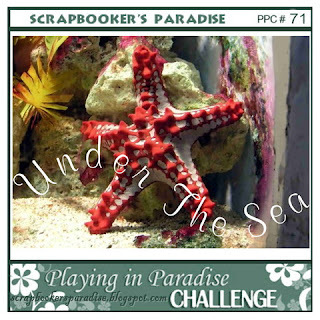 Happy Friday and happy June 1st, it is time for a new challenge for Playing in Paradise over at Scrapbooker’s Paradise. Merlie is our host this week, isn't this image darling. ﻿I have not used this Riley Stamp in forever, I coloured him with my Tombo markers. The sentment is just font I added to the bandaid clipart in Microsoft Publisher. Supplies: Natural Ivory and burgundy cardstock, Designer paper- Echo Park, Hanna Stamps - Riley, misc bandage clipart, candy dots. 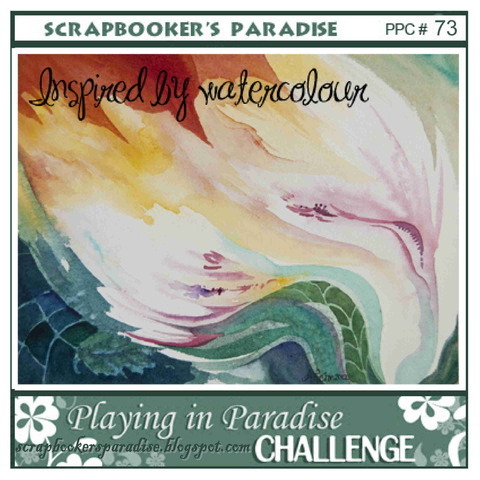 Please visit the Playing in Paradise blog to see the other Design Team members have created. Play along with us and you could win the prize. We love to see what you will create.